Jack Spruill ponders oyster spat’s propensity to settle on the unlit side of surfaces. When the mature shellfish detects a shadow passing, it rapidly closes up. But the oyster does not have a true brain — just one or two aggregates of nerve cells located near the hinge region. Spruill, vice president of PenderWatch and Conservancy, experiments with growing oysters on all kinds of surfaces — not for eating, but for the environmental services they provide, such as water filtration. He revels in describing “spat by the millions, just looking for a place to settle.” He makes necklace-like strings of old oyster shells and suspends them in the water below his dock. Before long, a sphere of oysters has formed around the recycled shells. Each ball supports dozens of living oysters and other wildlife, such as tiny crabs and grass shrimp that find homes in the crevices. He and other volunteers with PenderWatch also are active in creating living reefs along shorelines using recycled oyster shells. The living reefs are placed just offshore of marshes where they provide spawning and nursery area for blue crab, shrimp and clams. Finfish use oyster reefs as refuge and nursery. While fish flourishing around an oyster reef is an obvious benefit to ecosystems, a more subtle way that oyster reefs improve habitat is through nitrogen recycling, or converting nitrogen waste products into atmospheric nitrogen. 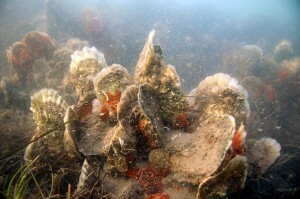 In a North Carolina Sea Grant study, Michael Piehler and graduate student Ashley Smyth at the University of North Carolina at Chapel Hill found that unseen organisms also flourish around oyster reefs. These microbes — that live in and on the sediment associated with the shellfish — are active in recycling nitrogen. A thriving community co-exists with oysters on a sanctuary in Pamlico Sound. Photo by Pelle Holmlund. Nitrogen is the most abundant gas in the air we breathe and the gas generally is inert. Nitrogen can be a problem when it’s in the concentrated form of fertilizer or nitric oxide. In the past 100 years, humans have dramatically altered the nitrogen landscape. Nitric oxide occurs in the exhaust of internal combustion engines. If fertilizers are applied in excess for farming and residential use, they may cause problems in nearby waters. There was a time when bioavailable nitrogen was locked in a cycle, much like the water cycle. Active nitrogen was not created except by an occasional lightning strike. Fertilizer came from manure or nitrogen-fixing crops such as peas. In the early 1900s, the Haber process established a method for chemically converting inactive nitrogen gas to ammonia, which can be converted to nitrates for fertilizers. A 2008 Nature paper estimates that almost one-half of the world’s population depends on synthetic nitrogen-based fertilizer to enrich crop soils. However, too much fertilizer in lakes, rivers or sounds can encourage harmful algal blooms, which smother and kill underwater vegetation and fish as the algae die and decompose, depleting the water of oxygen. Low oxygen is partially responsible for crab “jubilees.” It causes the blue crabs to crawl out of the water to the joy of harvesters. The crabs actually are seeking air because their water has become hypoxic. Welcome the oyster. Oysters — from small-scale oyster gardens or under-dock cages to larger natural or man-made reefs — feed on potentially harmful algae and other microorganisms, purifying the water in more ways than one. North Carolina has an offset trading program that gives credit for nitrogen removal, among other nutrients. Based on the current payment value, Piehler and Smyth sought to quantify the work of oysters in nitrogen recycling. In work published in the journal, Ecosphere, they established that reefs trap and recycle nitrogen. They put the nitrogen-recycling value of an acre of reef at $3,000 per year compared to $400 per year for a mudflat. “Excessive nitrogen loading to our estuaries and coastal regions is clearly a high-priority issue. Understanding the contribution that oyster reefs, seagrass beds and salt marshes can make to limiting the bioavailable nitrogen in these systems has value for both ecosystem science and ecosystem management,” Piehler comments about the work. Piehler’s lab at the Institute of Marine Sciences, or IMS, in Morehead City specializes in nitrogen dynamics of estuarine systems. Piehler and Smyth studied nitrogen removal in the estuarine system along the southern shoreline of Bogue Sound. Their groundbreaking research leveraged a National Science Foundation grant. Included on the grant are scientists from Florida, Georgia and Massachusetts. Sea Grant previously funded one of the researchers, Jonathan Grabowski, now at Northeastern University in Massachusetts. Smyth and Piehler sampled the sediments from mudflats, submerged aquatic vegetation, marshes and oyster reefs. They took 2.5- by 7-inch cores of material back to the lab and incubated the specimens in an environmental chamber. They then measured the amount of nitrogen gas emitted by the cores. 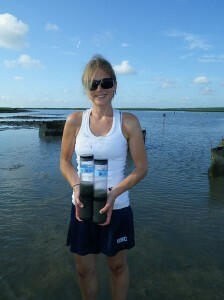 Ashley Smyth collects sediment cores for nitrogen measurements. Photo by Michael Piehler. Samples with higher amounts of active microbes would be expected to release more nitrogen gas. The team found that among all the habitats sampled, the sediments around oyster reefs exhibited the highest rates of denitrification or conversion of active nitrogen to inert nitrogen gas. Based on the Bogue Sound landscape, they estimate that oyster reef sediments remove 25 percent more nitrogen than intertidal sediments without oysters. Smyth and Piehler call the oyster reefs “hot spots for biogeochemical cycling.” This is because as the oysters filter feed, they absorb nitrogen for growth and reproduction, plus they excrete material that microbes colonize. The microbes process the ammonium in the excreta into inert forms that do not cause negative effects. Their work indicates that at present, the marsh, aquatic vegetation, mudflats and oysters of the Bogue Sound estuarine system are able to process the current input of nitrogen. As described in their report, this explains the high-quality water of Bogue Sound. “This work has opened our eyes to the services played by oysters and oyster reefs in promoting denitrification. They show that the denitrification service is far more valuable in economic terms than even the habitat provision service. Hence, Piehler has publicized an entirely new motivation for oyster reef restoration and treating oysters as a habitat of value,” says Charles “Pete” Peterson, an expert in reef dynamics at IMS and vice chair of the N.C. Environmental Management Commission. Oysters have long been a staple of the state’s tidal creeks and estuaries. Native American feasts are indicated by piles of shells, or middens, at old settlements. At one time, reefs were so thick in the Mid-Atlantic sounds that they interfered with boat traffic. Researchers Hunter Lenihan and Peterson previously published that oyster reef heights in the Neuse River estuary decreased from 6 to 8 feet in 1868 to only 1 to 3 feet in 1993. 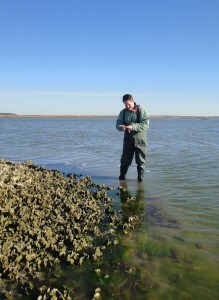 Michael Piehler examines an oyster reef in Bogue Sound. Photo by Ashley Smyth. In North Carolina, oyster harvests have been in decline from a record high of 1.8 million bushels in 1902 to a record low of about 57,000 in the early 1990s, with an increase to 150,000 bushels in 2011. Oysters are listed as a “species of concern” by the N.C. Division of Marine Fisheries, or DMF. To help overcome the depletion in oysters, DMF is planting them on a large scale. Oysters prefer to settle and grow on oyster shell, but they will grow on a number of stable substances such as lime-rich marl, which sometimes is used by the DMF to create oyster sanctuaries. Oyster sanctuaries also support fishing grounds that are targeted by anglers because of the bottom habitat created. A UNC-CH study by Joel Fodrie and Grabowski found commercially important fish species, such as menhaden and croaker, were more abundant in oyster reefs relative to mudflats in the Rachel Carson National Estuarine Research Reserve. This study was supported by a 2010 N.C. Fishery Resource Grant, which is administered by Sea Grant. Separate research conducted in Pamlico Sound by David Eggleston at North Carolina State University, Brian Efland of Sea Grant and others set out to document whether marl attracted oyster settlement and if fisherman would find more fish on marl-based sanctuaries than sandy bottom. Their work was part of a $5 million Federal Recovery Act grant administered by the N.C. Coastal Federation in cooperation with DMF and others. Efland conducted interviews with fishers who “thought the project was a good idea and a good use of taxpayers dollars.” He also conducted aerial surveys of the reefs to determine if fishing was concentrated there. The team estimated the added value of oyster restoration to recreational fisheries could be as high as $367,000 per year in 2011. However, they found that boring sponges are able to naturally drill into marl and may cause oyster mortality because of toxins. Now in a new FRG-funded study, Eggleston is looking at alternative substrates, such as concrete and granite, to create oyster sanctuaries. The earlier study documented that oysters multiply on the reefs, along with a surprise — stone crabs, which do not normally occur as far north as the reefs they sampled. Stone crabs, which previously were found only south of Cape Lookout, have expanded their range north to include the sound near Cape Hatteras. “Stone crab densities were just as high as in areas of the Florida Panhandle that are the population center of stone crabs,” Eggleston notes. “Some of the highest densities in the states for stone crabs are now in the Pamlico Sound,” he adds. However, Eggleston’s data indicate that stone crabs are not a major concern for predation on oyster reefs. Katherine Pierson, Eggleston’s graduate student, received a master’s degree for her part in studying the fish species attracted to the reefs. Using fish traps or gillnets, the team found that the relative abundance and number of fish species was higher on oyster reefs. They found fish that are important to the North Carolina coastal fisheries, including Atlantic croaker, black sea bass and blue fish. DMF also is constructing oyster reefs with recycled shells. The program, started in 2003, serves the dual purpose of keeping the shells out of landfills and also creating more reefs for both oyster fishermen and anglers. In 2006, DMF created a dedicated oyster shell recycling position. Sabrina Varnam, now known as the “oyster queen,” became recycling coordinator and got the ball rolling. Starting with a total of only 700 bushels recycled in 2003, the program has increased to 27,000 bushels recycled in 2011. Varnam coordinates with volunteers, restaurants and landfills. She even arranges for private carriers to pick up shells from high-volume restaurants, such as the 42nd Street Oyster Bar and Grill in Raleigh. Restaurants contribute more than one-half of the recycled shells. “Recycling’s for everybody’s benefit. The oysters filter the water and keep our water clean. It benefits our operation and the oyster industry,” says Brad Hurley, owner of the Raleigh restaurant. Landfills see the benefits of recycling too. “It’s a great reuse of the shell and it closes the loop. Folks can take their shells right back to where they got them and they are processed back to the waterways,” comments Sam Hawes, New Hanover County landfill manager. 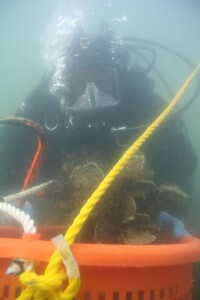 A diver collects samples from an oyster sanctuary. Photo by Pelle Holmlund. Shells are stockpiled first in landfills before they are loaded with a front-end loader onto 18-wheelers for transport to one of the several collection sites near the sounds, where they are later transferred onto a barge for planting. On the barge, a worker sprays the shells into the water with a high-pressure hose. Sites are selected for their likelihood to accumulate juvenile oysters, or spat. Unlike the oyster sanctuaries, these sites are open to oyster harvest, so that we may see more North Carolina oysters on our plates in the future. Varnam continues efforts to publicize her mission. She is creating a video and brochures with funds from the N.C. Coastal Recreational Fishing License program. That project includes Sea Grant as a partner. The funding reflects the benefits of oyster reefs for recreational anglers. “Everyone can benefit from this program and I think that’s why it’s been so successful. Whether you love to eat oysters, harvest oysters, if you’re a restaurant owner, you love to fish or whether you’re concerned with water quality or shoreline erosion, everybody feels like it’s one of the best state programs out there,” Varnam says. Similarly, living shorelines constructed with bags of oyster shells attract live oysters that filter water and provide habitat. The Coastal Federation lists 25 sites along the state’s coast where it has assisted private and public properties create such shorelines. A permit is required from the N.C. Division of Coastal Management for their installation. PenderWatch also collects oyster shells and creates reefs near Hampstead. Spruill and other volunteers monitor the reefs. The group hopes that the reefs will help to stabilize shorelines. Varied research continues to determine how and where the oyster-based living shorelines may provide estuarine erosion control. As the federation’s Ted Wilgis decribes, the reefs consist of oyster bags stacked like firewood in a long pyramidal shape 50 to 100 feet long. “The oyster larvae swimming around in the summer are looking for some place to land and attach. The oyster shells are that natural hard substrate,” says Wilgis, who also worked on Sea Grant research while a graduate student at UNC Wilmington. The larvae help create the living reef. “Along with the oyster larvae come all the small fish, shrimp and crab, blennys, gobis and all different kind of mudcrabs that make the reef function along with the oysters. Once you see that, you start to see a lot of other fish coming in feeding on these guys, or fish like gag grouper using the reef for temporary refuge as it hides there in its juvenile stage,” Wilgis explains. Wilson Bay is another place that uses bagged oysters. Before 1998, the bay was an unpleasant 100-acre receptacle for treated sewage in Jacksonville. Oysters proved their value in an experiment in the bay to test their capacity to purify water. Now it is a pristine park, and a site for children to play and study ecology. Learn about oyster shell recycling via the N.C. Division of Marine Fisheries website at: portal.ncdenr.org/web/mf and search for shell recycling. Watch for a future Coastwatch story on living shorelines and other estuarine shoreline research. The under-dock program promotes raising oysters under docks in waters open to oyster harvests. Under-dock permits are required and obtained through the N.C. Division of Marine Fisheries. The permitting process includes reading an informative manual and test created by Steve Rebach, North Carolina Sea Grant’s associate director. Much of the information comes from studies by Jim Swartzenberg, who conducted numerous Fishery Resource Grant projects to evaluate off-bottom culture of oysters, Rebach says. New participants may choose to join the Shellfish Gardeners of North Carolina and attend one of their workshops. Participants start with cages, which are actually plastic sleeves containing 1,000 seed oysters, that growers float under their docks. As the oysters grow, the gardeners transfer them to bigger cages. According to John Zimmerman, president of the group, oysters can mature in as little as nine months instead of the usual three years that a wild oyster may require. Just like vegetable gardening, there is work involved. Crabs, algae or sea squirts may invade and hamper growth. However, if everything goes right, the 1,000 seed oysters can be counted on to mature into about 800 oysters, Zimmerman says. The proud gardener could have a harvest of about five bushels — enough for a crowd! Find out more about the under-dock program by going to the N.C. Division of Marine Fisheries website at: portal.ncdenr.org/web/mf and searching for under dock. Check the Shellfish Gardeners of North Carolina website at: www.oystergardenersnc.com/home.html. This article was published in the Autumn 2012 issue of Coastwatch.